Theories of how the world began have abounded for centuries. Many of these theories turned into a religious quest for power... some questioned the existence of God... and some look even deeper for the answer. One of the possible answers examined is the existence of the Annunaki. Ancient Mesopotamia (Sumer) is home to the oldest known civilization of mankind... the Sumerians. It was located in what is now Iraq. If the writings of these ancient people has truly been translated correctly... as author Zecharia Sitchin believes he has done... Earth's formation began as a collision between two planets, one named Nibiru (also known as Marduck) and the other Tiamet, over 450,000 years ago. Nibiru caused the planet Tiamet (who in other legends is a goddess) to break in half. One of the moons of Nibiru struck one of the halves, which placed it in another orbit altogether... a place we now call Earth. The other half of Tiamet became the comets, according to Sitchin's translation of Sumerian legend. These legends also speak of a race of giants that once roamed the earth. 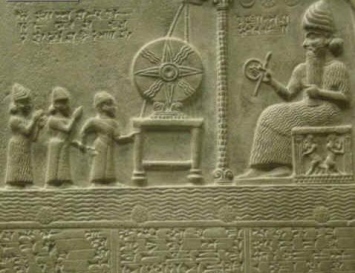 In the Bible, Genesis chapter six, speaks of there being giants in those days... and while it is believed by many in the Church that these beings were angels... the Sumerians believed they were a race of aliens from the planet Nibiru. This race was called the Annunaki. The word itself refers to the offspring of the deities Anu and Ki. The Earth in its infancy was extremely rich in natural minerals. The Sumerians believed that the Annunaki were on the planet to mine the rich resources... and they created from their own DNA and that of the Homo erectus (prehistoric man) the Homo sapien... humans. They did this to enslave mankind to further scour the Earth for gold and other precious metals. 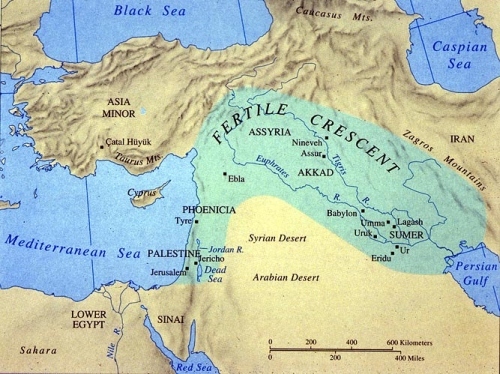 Sumer was constructed under the direction of the Annunaki, and the city of Ur was the crowning point of this area. The gigantic race had shrines built in their honor and are thought by some to have designed and constructed the pyramids of Ancient Egypt. The Sumerians believed that the Annunaki were a highly superior, advanced race... and along with that superiority came extreme arrogance. This arrogance would lead to their exile. It was in the city of Ur that some believe the Annunaki met their end on this planet, from wars within their own ranks. Their selfishness and greed came to a head, and the quest for absolute power took their numbers down by their own hands. Zecharia Sitchin estimated the fall of Ur to have been between 2024 and 2000 B.C. He theorizes that the planet of Nibiru enters our solar system every 3600 years... and by all of his accounts, we are due for a visit! It is duly noted that Sitchin's findings have come under fire from scientists and astronomers. A majority believe that Sitchin's translations of the ancient writings are incorrect, and the mysterious planet spoken of by the Sumerians was actually Jupiter. However, it is just as important to note that since the beginning of time... there have been those trying to cover up the truth. There have been reports of "dark matter" looming very near our solar system. Is it a collection of particles that scientists theorize are distributed throughout the planets... or is the mystery of Nibiru and the Annunaki coming closer to being solved? It is known that the Christian bible has basis in many of the ancient writings. These parallels indicate that the writers of the Bible were recording history as they had been taught... however the Church took the Bible and made it about the agenda of mass control. Verses were rewritten to change entire meanings... books were removed. Our origins are shrouded in mystery... and there are those who have taken great pains to see to that. The question remains... why? This is wonderful news for those who are looking for best flight jacket and buy classic fitted cropped retro leather jackets. We are the best online shop for skinny cheap womens leather pants at affordable prices and custom leather clothes as well. Rests assure, we don’t compromise on quality while making cheap biker clothing for men closeouts. The Dogon a Connection with Ancient Astronauts?